The first database of global local access prices, with real prices paid by carriers for leased private lines and Ethernet circuits. Searchable database of over 500,000 transactional prices for local access circuits. Downloadable Excel workbooks containing six months of pricing data and pre-defined charting tools. Semi-annual Local Access Pricing Report, which analyzes and compares trends in local access service pricing, competition, and purchasing patterns. Download the product brochure on this page to get the full scoop (including prices, licensing, and more) or ask us a specific question about what this subscription gets you. 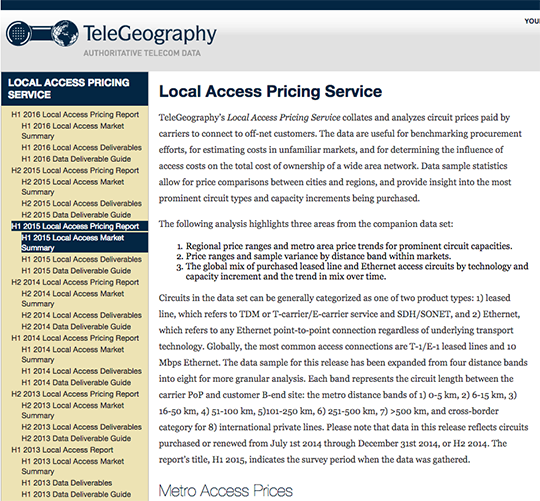 Learn more about what the Local Access Pricing Service can do. If you need to understand the undersea cable market, you need to know about TeleGeography. Their expertise has proven to be a valuable resource for my projects over the years.